The RR Type 2 Inverter is the smallest model in the range. 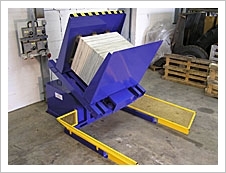 Offers floor level access for loads of up to 1000 Kgs in weight and 1400mm in height. It clamps and reclines under hydraulic power and revolves easily by hand. All RR Type 2 Inverters are painted with two coats of zinc primer and a 2 pack epoxy acrylic top coat as standard.